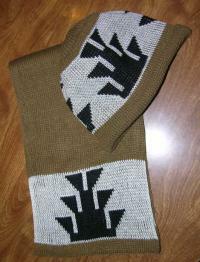 Native American Scarf and Caps are put together as a set to save you money. They are all Custom Knit so you can select your own colors and each design is offered in acrylic or merino wool yarn. We did not have photos of all the native motifs for the scarf and cap sets. Refer to the Adult Caps Category for all the motif design possibilities. T So if you don't see the motif you want in this scarf / cap category: Select the product with no image. There is an additional Option to type in your desired Motif.